Movies are the most distinctly modern art form. They began in the 1890s, and by 1910 had become a major industry, a new form of commercial leisure. Movies had also developed, by 1910, a distinctly "American" style. This assignment explores the development of movies. The very first movies, developed in America by Thomas Edison (pictured on the right), were intended as aids to industrial training. 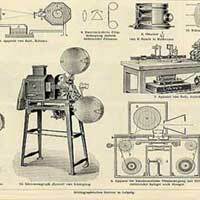 Viewers saw them by looking into a machine, the "kinetoscope," and turning a handle. A continuous loop of flexible film would pass across the shutter. Edison believed that all inventions should have some practical, money making application. He expected movies would be most useful in industrial training, teaching workers to do repetitious factory jobs. 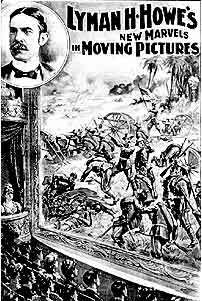 Though he and his team fooled around with the first films they made, shooting scenes of kissing, sneezing, and prizefighting, it took Edison a surprisingly long time to figure out that moving pictures would be best as an entertainment medium. The kinetoscope never caught on with manufacturers. It flourished as a novelty in the 1890s, with a slightly seamy reputation. By 1900 a number of separate inventors had realized that projecting kinetoscope images on a screen would make the medium far more attractive. Still, movie makers had a hard time figuring out what the new medium was best suited for. The very early projected movies—like this simple film on the left, of a train moving upriver towards Niagara Falls—often showed audiences things they had read or heard about but never seen. Film producers called them "actualities." These clips had a surprisingly powerful effect on audiences because moving images were so novel. When shown images of a train rushing towards the camera, for example, moviegoers jumped out of the way. "Actualities" showed real events, like street scenes or speeches. They frequently presented news footage—things like the sunken battleship Maine or scenes from the Spanish American War, as advertised in th 1898 poster on the left. They look unremarkable to us, but for turn of the century audiences they brought distant times and spaces together in new ways. Now movie audiences could see places thousands of miles away. In the first era of the projected motion pictures (roughly 1897-1905) most films were either documentaries or "actualities." You can see many examples of these at the American Memory web site. But not all the movies focus on "actualities." Many of the early films showed a more playful side of popular culture. As we will see, they also began telling more elaborate stories.